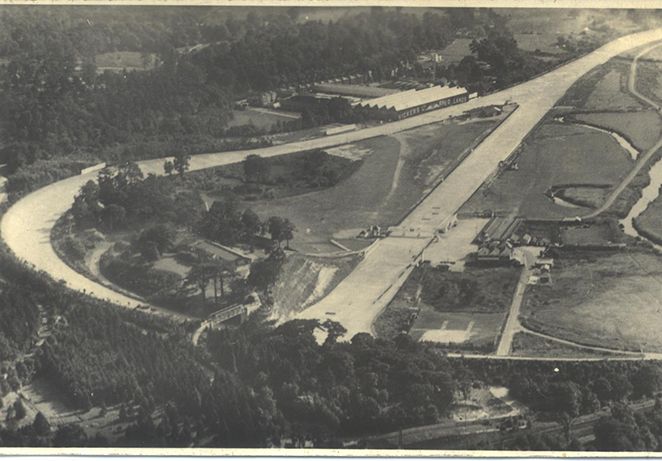 Originally constructed in 1907, the Brooklands race track was the 'Ascot of Motorsport' in its heyday. 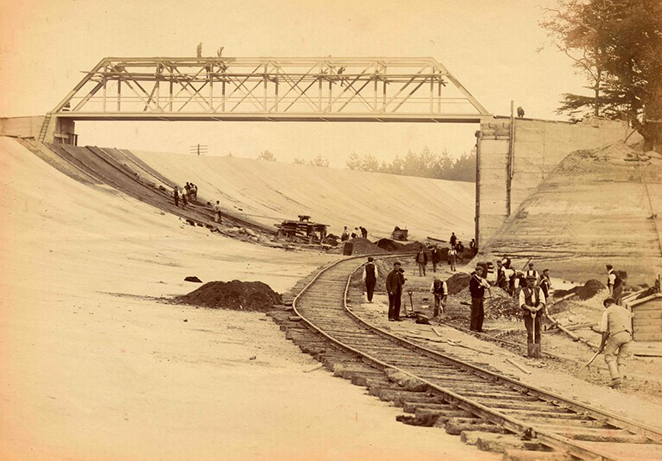 The outer circuit was 2 ¾ mile long, 100ft wide, with two long straights joined by two sections of banked curve up to 30ft high. Today only sections of the race track survive. 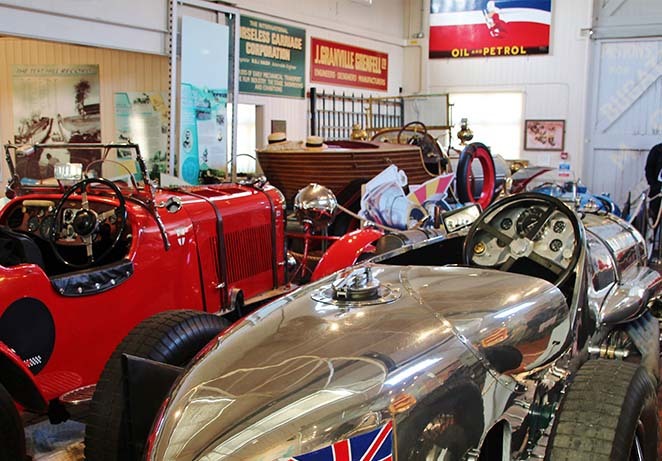 At the Museum, visitors can walk on the steepest section of the race track, following in the tyre tracks of the motorsport greats, such John Cobb, Malcom Campbell, Kay Petre, Noel Pope and the Bentley Boys. Keep reading to find out about the remaining sections that can be explored on the Museum’s 32-acre site. Is the steepest section of the Track and reaches nearly 29ft high, before descending onto the Railway Straight on the other side of the river. 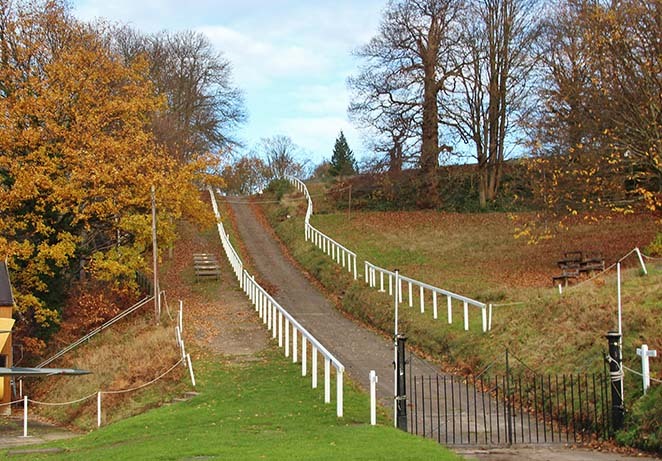 Providing vehicle access to Members’ Hill, this was one of Brooklands’ most famous landmarks. In 1940, due to the need to increase aircraft production in World War II, the Bellman Hangar was constructed across the Race Track’s Finishing Straight. The Hangar remained in place following the war, obscuring the iconic view where racing history was made and making it difficult for visitors to connect it with the Clubhouse and Paddock. The Finishing Straight is now a Scheduled Ancient Monument, but remains divided by the Bellman Hangar. 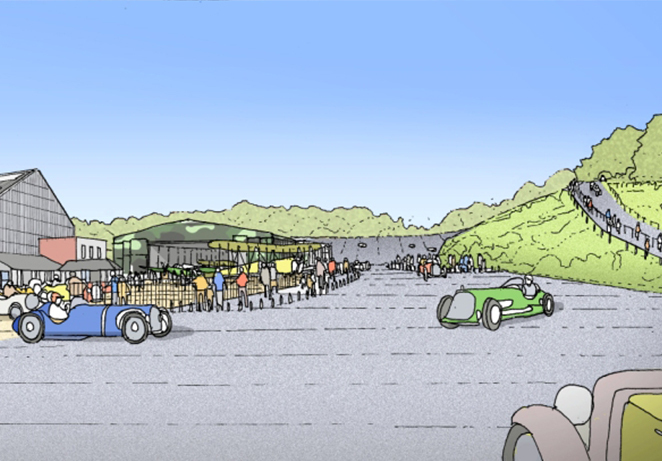 The Re-Engineering Brooklands project will finally reunite the two sections and restore its relationship with the other historic elements of the site. The reunited Finishing Straight will provide a venue for large-scale events, reminiscent of those which attracted the huge crowds that gathered on race days in the 1930s, and provide a stretch of track for riding in or driving a pre-war motor car. Test Hill was built in 1909 as another facility to encourage use of the track for development and test work. It was used by manufacturers to test both the ability of cars to climb steep hills and also of their brakes to stop them coming down. Today you can see it in use at many of our events.